This beautiful new rose was named after Constanze Mozart in a ceremony in Mainau on July 13, 2012. Image: Mainau.de. As 2012 draws to an end, we have much to celebrate whereas Mozart is concerned, for this year was host to significant historical moments. The most notable of these include the world premiere of Mozart's Allegro Molto in Salzburg, the return of his fortepiano to the former Domgasse 5 residence in Vienna and the 150th anniversary of the Köchel-Verzeichnis, a complete chronological catalog of Mozart's compositions. There were two additional occasions this year which implied celebration for Mozart through his wife Constanze, including her 250th birthday anniversary and the world premiere of Marrying Mozart in New York, the first work of historical fiction about Mozart's life to hit the stage since Peter Shaffer's Amadeus. And unlike Shaffer's work, Stephanie Cowell's Marrying Mozart validates Mozart and Constanze's courtship and marriage with tender affection, as it really was between them. In personal reflection, it was another year of unceasing challenge as an independent arts professional, a life which continues to test my determination and dedication to my passion to limits unsurpassed. I also received the heart-wrenching news about the death of my friend and mentor, Chris Andrews, who helped establish my voice for Mozart. Amidst these difficult moments, there were also joys in the ever-growing community of Mozartians I've come to know through my work, as well as the excitement of the year's aforementioned events. And I always find strength and consolation in a woman who inspires me to continue no matter how dark the hour. Constanze Mozart. Her story is one of great courage, perseverance and accomplishment. The new forum I created for Constanze Mozart in January 2012. ConstanzeMozart.lefora.com. In January 2012, I created a forum for the study and advocacy of Constanze Mozart in honor of her 250th birthday year. As far as I'm aware, it's the first and only online forum dedicated to her life (although I do hope there are/were others!). I entitled it Constanze, Mozart's Beloved after the book by Agnes Selby, which opened my eyes to the rigorous 50 year campaign led by Frau Mozart to secure her husband's music for posterity. Since Constanze, Mozart's Beloved was out of print, I introduced the idea of republication to my colleague with Hollitzer Wissenschaftsverlag in Vienna. His publishing company has significant distribution to English and German-speaking countries. Much to my excitement, he decided to pursue a contract with Ms. Selby this year and it gives me great pleasure to announce that the book will be widely available again in 2013 to welcome a new and broader readership! Heidi Knoblich (center) organized Constanze's official birthday celebration. Irmgard Wellman (second from left) is a descendant of Constanze's mother and Gerhard Pregger (right) is from the family of Constanze's great-grandfather. Badische Zeitung. Through the newly created forum, Ms. Selby introduced me to her friend Heidi Knoblich, an author and native of Constanze's hometown of Zell im Wiesental, Germany, who was organizing events in honor of Constanze's birthday anniversary throughout the year. 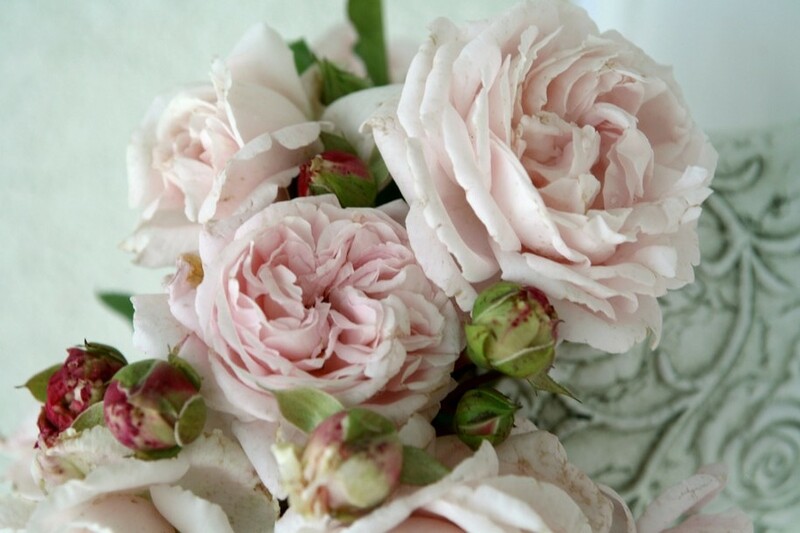 Through this connection, I became aware of the January 5, 2012 event which included Constanze's descendants and also the Rosentaufe (Rose baptism) in Mainau on July 13, 2012, in which a beautiful new rose was named in her honor. 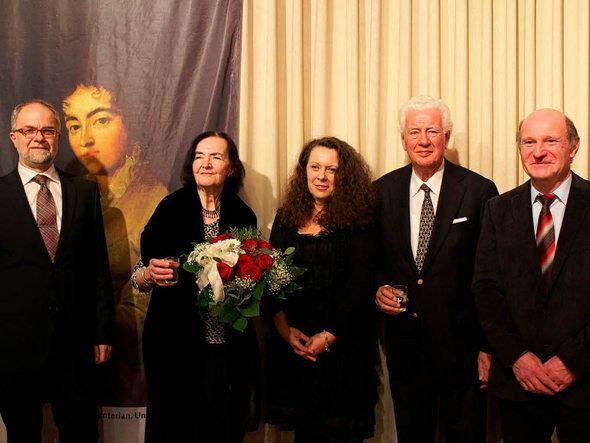 The Mozarthaus Vienna hosted a symposium on May 9, 2012 in honor of Constanze's anniversary. 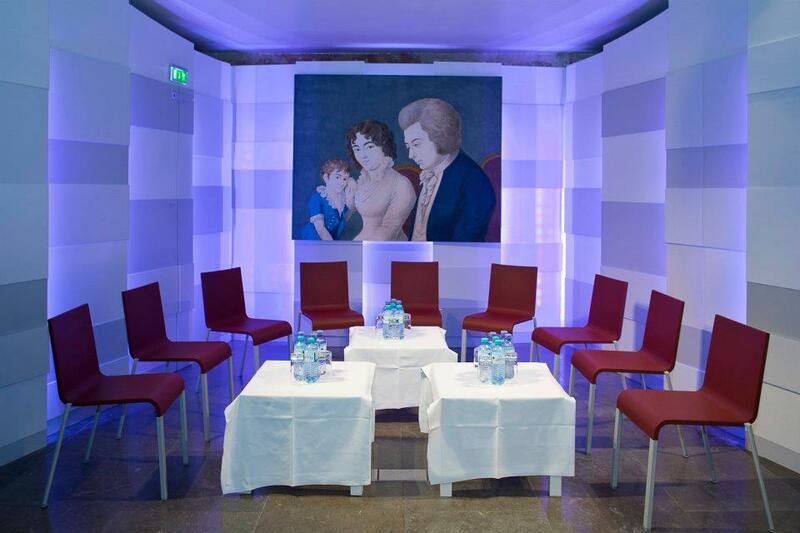 Fachtagung im Mozarthaus Vienna bringt ein neues, differenzierteres Bild von Constanze Mozart (Conference in Vienna Mozart House brings a new, more nuanced picture of Constanze Mozart). The conference area for the Constanze symposium at the Mozarthaus Vienna. It showcased an artwork of the Mozart family who lived in this residence during Mozart's most prosperous years in Vienna. Image: Mozarthaus.at. A newsworthy year for Mozart is fortunately commonplace, even today, but let us revel in 2012 also being a truly great year of well-deserved recognition and celebratory regard for Constanze Mozart: wife and mother, iconic guardian and preservationist. It's my hope that this information will encourage others to discover and embrace her as one of music history's greatest heroines. For news, discussion, scholarship, multi-media and more about Constanze, please visit (and join!) the forum. Also, be sure to watch for the republication of Agnes Selby's Constanze, Mozart's Beloved in 2013!